Henry Firth and Ian Theasby are the boys behind BOSH!, the social media sensation that has taken the vegan community by storm. The duo are famed for their tantalising and easy to follow recipe videos and have racked up an incredible following on social media. The plant-based pair have created a food revolution through the world’s biggest plant-based platform. They posted their first video in June 2016 and it exploded with 3.5 million views within a week. 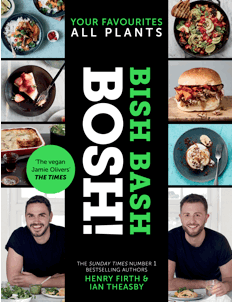 BOSH!, their first cookbook, was the highest-selling vegan cookbook ever, and with over 2 million followers across all their fast-growing channels, BOSH! are on a mission to show the world just how versatile cooking with veg can be. Henry & Ian both come from digital marketing backgrounds. After becoming vegan, they found two problems – there wasn’t enough good food available and they had to re-learn how to cook. They shared the results of their search on plant-based lifestyle platforms with a resource that offered simple but delicious vegan recipes. Neither Henry or Ian are professionally trained, but they’ve always been foodies, they like to think of themselves as food-remixers; they take classic dishes that they enjoyed when they ate meat and dairy and make delicious vegan alternatives. Ultimately what makes them successful is that they create super-achievable and relatable food – the kind of stuff you would cook at home. Not too fancy, and all ingredients are available in your local supermarket. Real people food. Ahead of the upcoming release of their follow-up cookbook, BISH BASH BOSH, these “vegan Jamie Olivers” are ready to transform Australian eating habits, and are available for interview. In BISH BASH BOSH! you’ll discover a whole world of quick eats, weeknight suppers, showstopping feasts, and incredible sweet treats – all using the power of plants. From a hearty, classic lasagna to an indulgent mini banoffee meringue, and from quick quesadillas to an incredible curry house jalfrezi, these are simple, savvy recipes that you’ll turn to time and again. Join the plant-based revolution here.